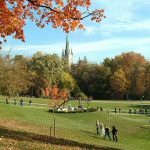 The transition from fall to winter in Canada is hard, we get it. Dreams of grass between your toes, barbecues by the lake and happy hour on the patio are tough to snuff when you’re scraping frost from your windscreen with a sniffly nose in the seemingly eternal darkness. But just because the snowy season is long, doesn’t mean it has to be unpleasant. 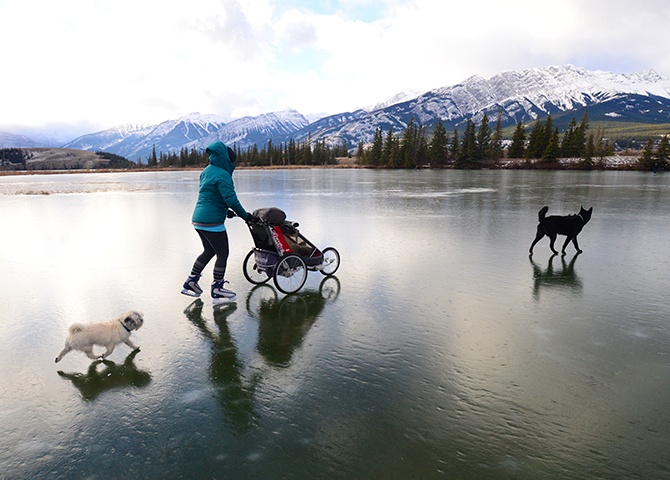 In Jasper, local families know that the key to well-being in winter is to get outside. 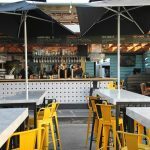 So pull on your merino long johns, zip up your down vest and plonk down that toque. Because if the experiences are cool enough, there’s no such thing as too cold. Fat biking in the winter is officially a thing now, especially in Jasper! Were you under the impression that when the first frost hit it was time to stash away your two-wheeled steed? Not in Jasper. When the snow flies, trails are transformed and the entire landscape sparkles white. Fat-wheeled snow bikes, with their extra tread and low-pressure tires, have become as prolific as puffy coats. By spreading out a cyclist’s weight—not unlike the extra-wide hooves of a mountain caribou—fat bikes allow riders to gain better traction in the snow. Beyond the winter workout, fat biking is catching on as an exciting new way to traverse Jasper’s incredible trail system, and Parks Canada has been flat-packing popular loops to make biking out to picturesque Lake Edith, for example, a little easier. The trick to fat biking fun is good gear: thick gloves are essential, as is a thermal underlayer. Using a ski helmet rather than a bike lid gives you the option of fitting a toque underneath, but be prepared to shed some layers: a steady clip keeps the chills at bay. Fat bikes are readily available to rent in Jasper (try The Bench Bike Shop or Jasper Source for Sports) and a quick stop at the Information Centre will let you know which trails are suited for seasoned cyclists and which ones are best for biking beginners. Every year in Jasper National Park, after the mercury starts to plummet but before the snow squalls arrive in earnest, there is a brief window of opportunity to experience a particularly glorious gift from nature. This special season takes place just before the ski slopes come alive; locals know it as wilderness skating primetime. 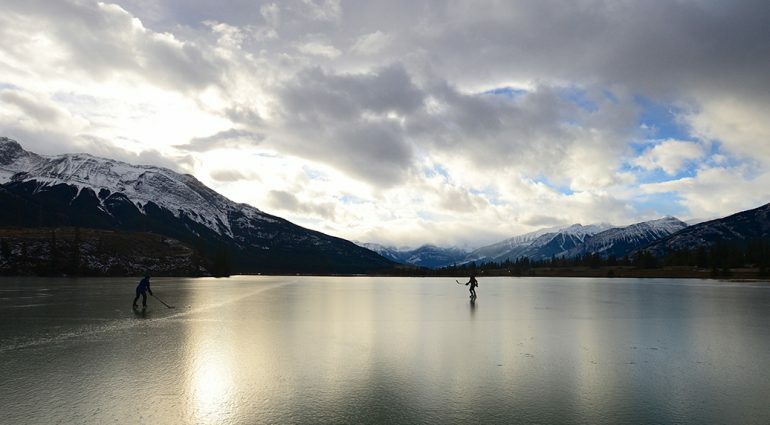 While a November cold snap can be a bit of a rude awakening if you haven’t pulled your winter boots out of storage, for those who’ve experienced the freedom of skating on a frozen lake, marsh or creek in Jasper National Park, the dip in temperature signifies soon-to-be serenity. 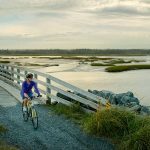 With dozens of lakes, sloughs and tributaries dotting the Athabasca River Valley, there are a multitude of potential playgrounds for you and your family to find. Imagine kilometres of glass-smooth ice with a Group of Seven painting as a backdrop and you start to get the idea. Of course, epic ice conditions don’t always materialize. But if you’re lucky, you’ll find yourself lacing up after the perfect combination of cold and dry, a recipe which makes the surface safe (Parks Canada advises a minimum of six inches of ice for skating) as well as smooth. Once the winter is here for good, there are wonderful outdoor rinks maintained at Mildred Lake near the Fairmont Jasper Park Lodge as well as on Pyramid Lake, but the truly serendipitous skating happens when it’s just you and the big wild. 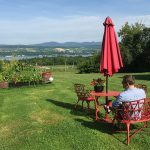 Some of my family’s favourites include Talbot Lake, where you can watch northern pike swim between your feet just under the green-tinged surface, and Cottonwood Slough, where the A-frame of Pyramid Mountain backdrops a pond teeming with wildlife tracks. Grab a pair of skates, a helmet and feel the frictionless freedom of glorious gliding. It’s not as hard as it looks! 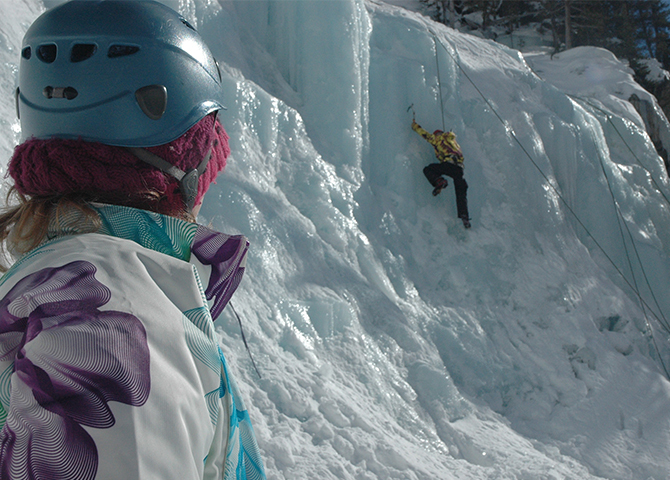 Give ice climbing a try at Tangle Falls in Jasper. You might think ice climbing is just for energy drink-chugging, helmet cam-wearing, extreme athletes with a death wish. Far from it! Ice climbing is perfectly accessible for young kids as well as past-their-primers like yours truly. 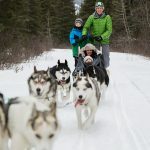 While the Icefields Parkway is world famous for its bounty of challenging ice routes (all those waterfalls you gawk at during the summer freeze solid once the sun starts spending more time on the other side of the equator), for those new to the sport, there are plenty of ways to ease onto the ice. Local guiding outfits like Rockaboo Mountain Adventures might take first timers to Maligne Canyon, where a gallery of chandelier-like ice formations lead to a bevy of beginner routes. Even more magical, for the view you get from the top, is Tangle Falls, where glacial waters have solidified into a heavenly staircase. Because of the specialized equipment required—including harnesses, ropes, ice axes and crampons—plus the wherewithal to use these tools, this is a sport to slide into slowly, with the help of someone experienced. Once you and the kids top out on your first pillar of frozen water, however, you’ll feel like you’ve conquered winter (no energy drink needed). Winter is cold, yes, but in Jasper National Park, if you’re up for an adventure, finding new ways to play outside is the coolest.